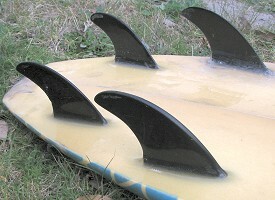 Fiberglassed foam blank, 1/16'' redwood stringer, spray decor, left hand plug. 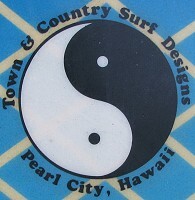 Small Town and Country Surf Design - Pearl City, Hawaii with Ying/Yang circle in black and white at the nose. 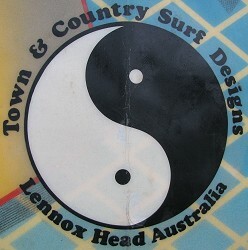 Large Town and Country Surf Design - Lennox Head Australia with Ying/Yang circle in black and white at centre. Gunther Rohn, blackscript across tail. Large Town and Country Surf Design - Lennox Head Australia with Ying/Yang circle in black and white at sweet spot. 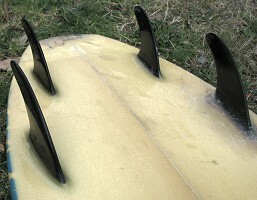 surfblanks phenolic, black text across pod. 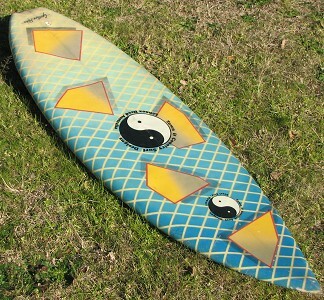 Deck: GR 5' 9'' x 19 3/4'' at tail along the stringer. Deck : Full blue cross hatch spray, fading from nose to tail with transposed with five yellow grey and red quadralaterals with shadowing. Post production adhesive stickers for Rip Curl and Instinct. 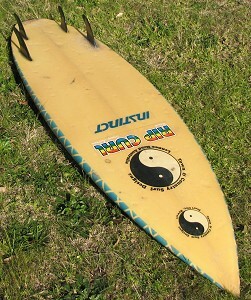 BOARD HISTORY: Liberated from Randwick Council kerbside rubbish collection and donated by John McInnes in July 2008. See 1982 Town and Country Thruster #41.